ATLAS QUESTIONS PACQUIAO'S LEGACY; IS SELECTION OF OPPONENTS HURTING HIS REPUTATION? During last night's telecast of ESPN2's Friday Night Fights, studio host Brian Kenny asked ringside commentator Teddy Atlas what he thought Manny Pacquiao's latest win, a dominant unanimous decision victory over future Hall of Famer Shane Mosley, has done for his legacy. "Well, it leaves a question mark. It doesn't do a lot for it in the positive. I mean, if anything, it's either neutral or negative to be quite honest with you," Atlas suprisingly remarked, sounding unimpressed with Pacquiao's performance. In fact, Atlas would go on to question Pacquiao's last 5 victories, which have made the Filipino superstar the international icon that he is today. "It opens the question, these last 4, 5 fights, 6 fights, that have made him an icon, these marquee fights, who have they been with? One was with De La Hoya, who was a guy who looked like a shot fighter, dead at the weight. Another one was with Cotto, a guy who was a damaged fighter, psychologically and physically, after Margarito did what he did to him. Another one was with Clottey, who didn't fight; he just covered up all night long. Hatton was made to order. Margarito looked like he had no strength; he was dead at the weight. So it makes you start to think that...and of course Mosley, almost 40 years old, came with no effort, it looked like, to win the fight, just to get a paycheck," Atlas would explain as he pointed out some of the criticism Pacquiao has received from some regarding his selection of opponents and the decision to face them at catchweights. "It makes you start to wonder about his legacy. Has he been built up with guys that were perfectly picked, perfectly matched, where they had problems and that's why he was able to win so convincingly and that's why he's become such a star? I know he's a terrific fighter and a terrific talent, but it kind of asks that question, has he been in there with a bunch of setups?" While Atlas may bring up some valid points regarding the flaws in Pacquiao's opponents, one can hardly place the blame on Pacquiao himself. After all, he's faced virtually every opponent there is to face in the welterweight division. When that very same fact was pointed out and Atlas was asked who else Pacquiao could have faced in order to cement his legacy, he replied, "Well, I mean, Mayweather of course. People will say that Mayweather didn't want to fight him, but Mayweather was ready to fight him if he would give a tube of blood and take Olympic-type testing to make sure that he's not on performance-enhancing drugs, so that fight right now is not being made." Evidently, Atlas is of the opinion that Pacquiao should be taking on fighters who are younger and hungrier as opposed to fighters that are at the end of their career. "But you got Tim Bradley out there. You know, some people will say maybe Bradley's not big enough, strong enough, but Bradley's quick, he's undefeated, he's a real game son-of-a-gun; he will do more, much more, in a live sort of way than a 40-year-old, or close to 40-year-old, Mosley," he continued. "But, you know, I agree with ya. There's not a lot that he's really missed there. There's not a lot of guys there that you can point a finger and say, 'Well, you avoided this guy; you avoided that guy.' I'm just saying that the guys that he did fight were perfectly set up for him. It's not maybe his fault, but they were guys, one way or the other, had a little bit of a flaw." At the end of the day, despite the critique of his opponents, Manny Pacquiao continues to defeat each and every fighter who steps into the ring with him. No matter the excuse or the perceived flaw in the competition, there's no denying the results that Pacquiao gets as he dominates each opponent like they've never been dominated before. Although a fight with Mayweather is the one that everyone wants to see, until it happens, you can hardly blame Pacquiao for being willing to face anyone else, even if those fighters are past their prime. Or can you? 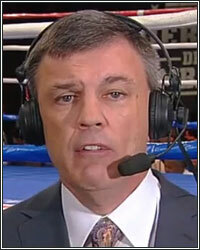 Does Teddy Atlas have a point? Should Pacquiao be looking to face younger, hungrier competition or are fans satisfied with his latest selection of opponents? Let us know in your comments below.